Helping the thrirsty: Good Samaritan Sister Marella Rebgetz, water engineer and member of the congregation’s new leadership team. THERE aren’t too many religious sisters who can claim to be water engineers. However, Good Samaritan Sister Marella Rebgetz has always had a practical, scientific bent of mind and has put her talents to use. Last month she was elected to the congregation’s new leadership team until 2023, and she is committed to the Good Sams’ Statement of Directions, which includes a commitment to ecological conversion and care for our fragile planet. The Sisters of the Good Samaritan live and minister in Australia, Japan, the Philippines and the tiny Pacific atoll nation of Kiribati, where Sr Rebgetz has worked for more than a decade on aid projects helping to address Kiribati’s critical water needs in the face of a fragile water lens, increasing population pressures and climate change. “We’ve all got issues with water – whether it’s scarcity in Australia, the driest continent, pollution issues with wells in the Philippines or salinity issues on Pacific islands threatened by gradual climate change,” Sr Rebgetz said. Sr Rebgetz knows a lot about the life-giving importance of water. She grew up on Cornelia, an arid, North Queensland cattle station – halfway between Charters Towers and Hughenden. “We would be officially declared drought-stricken every couple of years,” she said. The second of three girls, Sr Rebgetz’s early education was by correspondence and School of the Air, before leaving to attend St Mary’s School in Charters Towers. Jump forward a few years and Sr Rebgetz, in her early twenties, had studied physics at university, worked in Sydney at the Lucas Heights nuclear reactor facility and at St Vincent’s Hospital. While living in Sydney and pursuing her career in science, she “got to know” the Good Samaritan Sisters, through their good works running a halfway house for people living on the streets in Sydney. She volunteered to help, and over several years working there she came to understand the work of the Good Samaritan Sisters more deeply. “I felt at home there,” she said. “I heard the voice of God calling me to something more. So at 25, Sr Rebgetz joined the Sisters of the Good Samaritan – reluctantly at first. “I packed up my stuff and put it in storage,” she said. A few months turned into 25 years. Sr Rebgetz didn’t feel called to teaching – the path followed by many sisters in the congregation. Rather, with her scientific background and qualifications, Sr Rebgetz’s superior encouraged her to study environmental science and theology. Her studies led to an engineering degree, and her unique training fitted well with the Good Sams’ growing involvement in Kiribati, a remote Pacific nation of 33 low-lying coral atolls, vulnerable to the effects of climate change. After an initial stint living in Kiribati from 2000-02, Sr Rebgetz returned in 2008, bringing her skills and experience as a water engineer to work for the Government of Kiribati on a World Bank project to try to provide a secure fresh water supply into the future. “They (the I-Kiribati people) live on coral atolls, which are like a giant sandbar – quite literally,” she said. “They’ve got no permanent above-ground water – they rely on underground water in the form of fragile water lenses. Sr Rebgetz said she had often been questioned about why a religious sister would be working on government projects for the World Bank. “My response would always be – Jesus said give a cup of water to one of the least of these … I was thirsty and you gave me something to drink,” she said. In 2016-17, Sr Rebgetz undertook a well-earned sabbatical that took her to Israel, Palestine and the United States of America, where she participated in a variety of spiritual renewal programs. 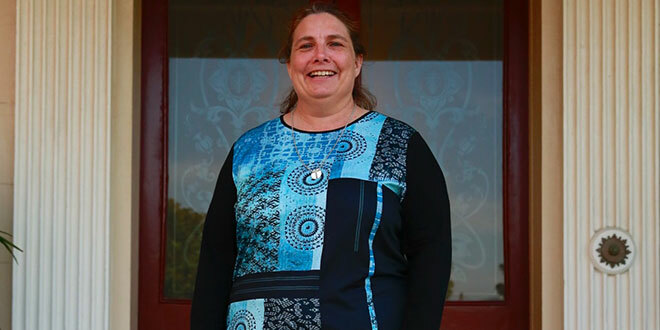 She said she was enthused about being elected onto the Good Sams’ five-member leadership team responsible for the pastoral governance of the congregation for the next six years, under congregational leader Sr Patty Fawkner. Part of the congregation’s Statement of Vision is a commitment to ecological conversion. “As a leadership team we have to look at what we can do about that, especially in the face of climate change, and my experience is something I can bring to this position,” Sr Rebgetz said. “Climate change is a gradual process, and very insidious. “Two millimetres’ rise in ocean level in a year is insignificant.